I am following this thread because I have the same issue. How was this resolved? According to the user who's experiencing the problem, it was a merchant related issue. I went ahead and tested your form and I am getting the following error when testing your API credentials. 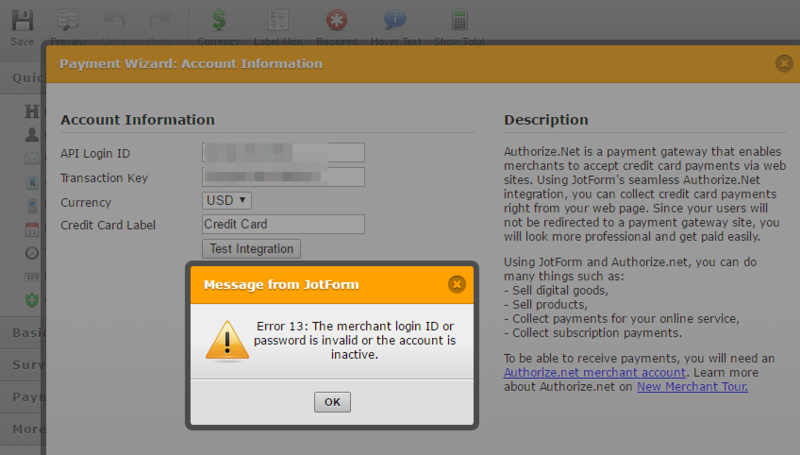 According to Authorize.net, the above error usually means that you've entered incorrect API credentials. We suggest to double check and review it again. Make sure to enter the right keys on the right box. API Login ID should be for the API Login ID. You can find more details about the error here https://support.authorize.net/authkb/index?page=content&id=A415&pmv=print&impressions=false.